FUMAPEST Hunters Hill Termite & Pest Control 1300 241 500 are licensed installers of the KORDON Termite Barrier in buildings during construction. 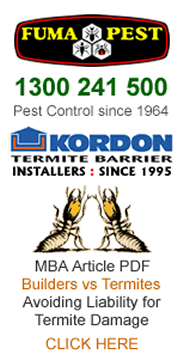 KORDON Termite Barrier for Builders is manufactured by Bayer Australia • complies with AS 3660 and is CodeMark Accredited to meet Hunters Hill Council requirements. Find Architects & Building Designers in Hunters HillCouncil region • includes business name • name of registered principals • contact details • address • phone • email • website. Find NSW Govt DFT Licensed Home Builders in Hunters Hill Council region. Hunters Hill Council TPO Tree Preservation Orders • Hunters Hill Council Application Forms • Tree Removal • Tree Lopping • Tree Pruning • Stump Grinding & Removal. FUMAPEST Hunters Hill Pest Control 1300 241 500 for safe effective pest control of cockroaches • ants • bed bugs • fleas • rats • mice • spiders • bees • wasps • silverfish • bird proofing • termite inspection reports • termite control • termite barriers • termite baiting.